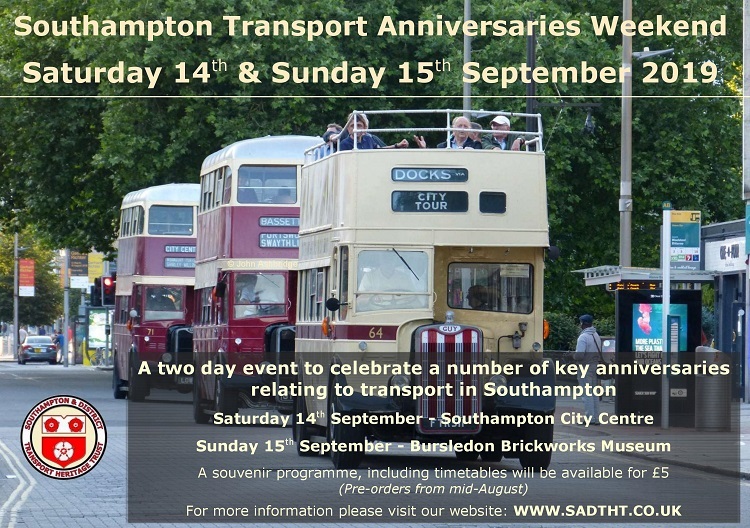 The Southampton & District Transport Heritage Trust are pleased to announce that it will be holding a weekend of events to celebrate a number of transport related anniversaries pertaining to the City. The event will take place over the weekend of Saturday 14th and Sunday 15th September 2019. The Saturday will be based in Southampton City Centre as part of the Heritage Open Days, where free bus links to SS Shieldhall, the Tram Workshop and the Bitterne Local History Society will be run. On the Sunday, the event will be based at the Bursledon Brickworks Museum, home of S&DTHT. It is planned to have the four remaining Southampton Guy Arabs on display plus a few visiting buses of the same type. There will also be a number of free bus links to local landmarks. S&DTHT Chairman David Hutchings said "This will be a wonderful opportunity to see for yourselves the progress made by the Trust and to see the remaining four Guy Arabs together in Southampton." For more information regarding this event, please see the events page. We were delighted that representatives of S&DTHT were present at the unveiling of the Institute of Transport Administration Award to the Bursledon Brickworks Museum on Thursday 28th March. The 75th anniversary of the foundation of the Institute is this year (2019). To recognise this and to encourage awareness of the transport industry, the IoTA National Executive decided to instigate awards to transport heritage sites, the first of which was made to the Bursledon Brickworks Museum. The award recognises the work that we, and the other groups on site, complete in maintaining the history of the transport industry for future generations to experience. The Bursledon Brickworks Museum Spring Craft Fair took place on Sunday 24th March, we were only to pleased to display vehicles as part of the event. Members of the Wessex Transport Society visited the Brickworks as well and were given a tour of our area. Also during the day 367 - BTR 367B provided free mystery tours. On Saturday 9th March, members of the Trust were invited for a tour of the Bluestar Depot in Eastleigh. We got to see behind the scenes of how a modern bus company works. Thanks to Andy, Ian and Alfie for hosting a interesting and informative tour. We were only to pleased to be able to assist our friends at the Vintage Transport Group, with providing a bus for use on their free heritage bus service as part of the Indoor Transport Fair at Cosham Community Centre on Sunday 3rd March. 367 - BTR 367B was used on the service throughout the day on varies routes in the Cosham, Portsmouth and Portchester area. The Southampton Model Railway Society Exhibition took place at Barton Peveril College, Eastleigh over the weekend of Saturday 26th & Sunday 27th January. A free heritage service was provided over the weekend, 133 - TTR 167H was used both days between the show and Eastleigh and Southampton Airport Parkway Railway Stations. Over the weekend of Saturday 26th & Sunday 27th January, the Southampton Model Railway Society Exhibition is taking place at Barton Peveril College, Eastleigh. We will be providing a free heritage bus service as part of the event. The service will run from the show to both Eastleigh and Southampton Parkway Railway Station.